As with all decorating projects, the secret to a good finish is to do your home work, and by that I mean to prepare yourself, your room and the surfaces being decorated. 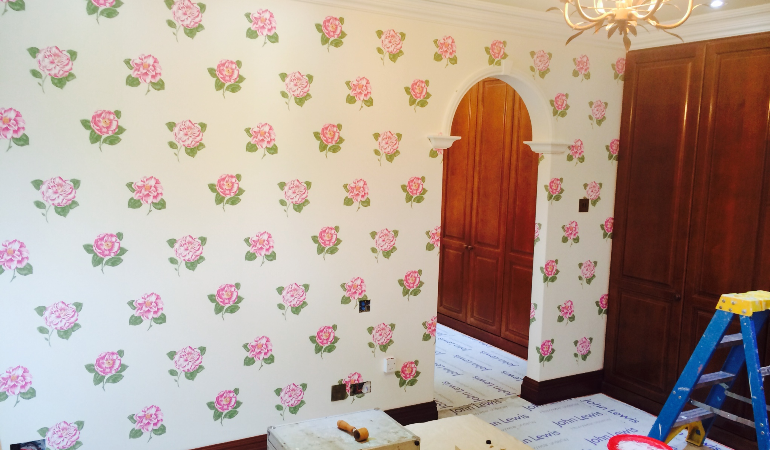 As a professional in the decorating trade, here is my advice on how to wallpaper. Get the best tool kit that you can afford. This will make the whole project much easier. Using quality, well-made tools will always be better than using cheap and cheerful alternatives. My wall-papering tool kit has evolved over thirty-six years, and I’m still adding to it when something catches my eye, but the basic kit doesn’t change. Always clean the ceiling or coving, skirting, windows and frames. Change you water regularly, wash and rinse the cloths or sponges often. 1. Always prepare the surfaces that are to be wallpapered. 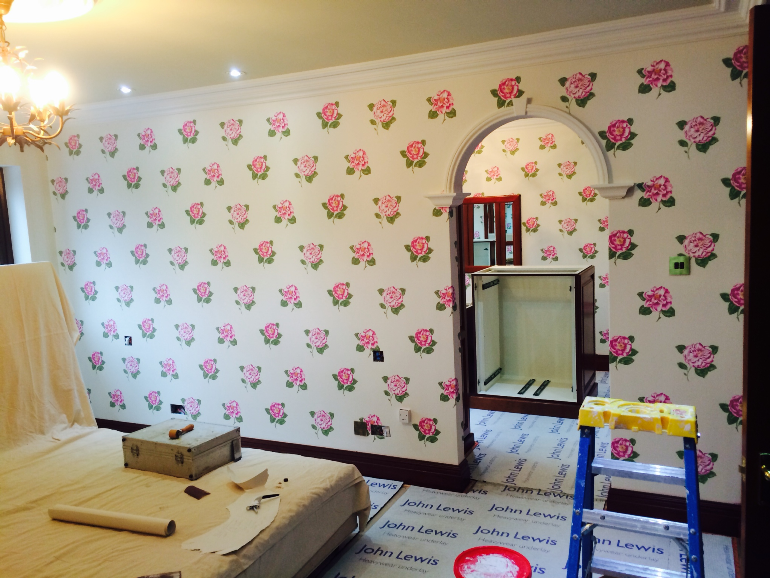 Time spent preparing the surfaces to be wallpapered is time well spent! 2. 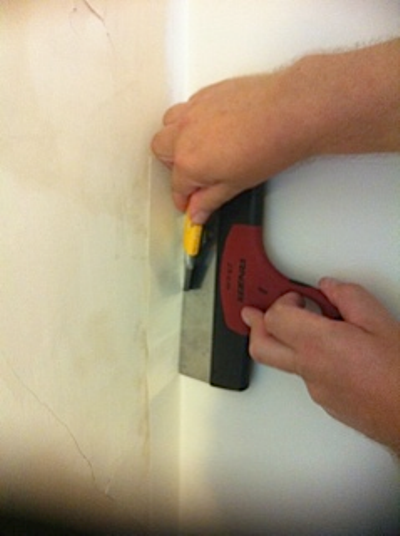 Wash old paste off the area and rinse well to prevent mould growing through the new wallpaper. After washing the walls, fill any cracks or holes, sand and line. 3. Make sure you buy enough wallpaper and some spare as you can never have too much. It’s also very important to check the batch and colour codes are the same. 4. Always read the hanging instructions label and follow the manufacturers recommendation on adhesives. It will tell you how much water you need to add and how much wallpapering can be done per sachet for all types of paper. Vinyls and spongeable wallpapers require a fungicide adhesive. 5.Where I can, I always use a ready-mixed trade-quality adhesive as this has a thicker consistency and can sometimes be thinned to suit the various wallpapers, like heavy duty Hessians, vinyls, embossed papers and flocks. Be sure to use clean, cold water and clean tools to mix. 6. Use the same wallpaper adhesive to hang the lining paper and wallpaper. My trade paste mixing tip is to get the water moving fast in a circular motion and, whilst it’s being stirred, gently pour the powder in a little at a time. Allow the mixed adhesive to stand for about five minutes before giving it a final stir. Top tip – I always number every length, making sure to mark what is the top & bottom. When marking, do this on the left middle and right, as if you need to trim the paper you may cut off the markings. Paste-the-wall wallpaper is becoming the standard now, meaning exactly what it says… you paste the wall Instead of pasting the wallpaper. This is an incredibly fast way to wallpaper. The main plus is there is no waiting for the paper to soak, and you can hang straight from the roll. 7. Using a small roller pole, a roller with a medium pile sleeve and a 50mm brush, paste an area of wall that’s just a little wider than the width of the wallpaper. 8. On the paste table measure, match & cut each length allowing an extra 50mm at the top and bottom. 9. Mark the back of the paper at the top/bottom in three places left, right and middle. You do this so if you trim part off a length to fit some where else, you may cut this mark off. 10. Create a straight line by using a plumb Bob & pencil, checking with a spirit level. This is your guide to make sure the wallpaper is straight. 11. Simply let the wallpaper make contact at the top of the wall smoothing the paper from left to right, and up and down as you go aligning to the plumb line or pattern if you have got more than one length up. Pasting onto paper is the traditional method, which has good and bad points: The good points being the paper becomes softer to handle and fold, creases less and can be stretched a little with skill and experience. However, it does have to be allowed to soak for the right amount of time and cut to a length that can be trimmed when on the wall. 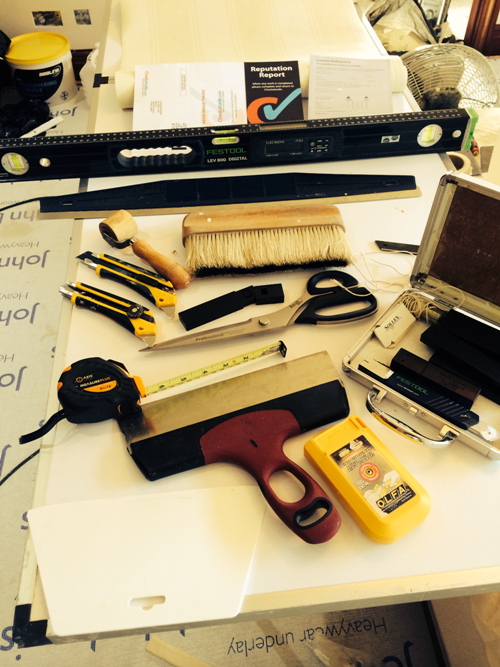 Top tip – I generally cut the whole room or feature wall on the paste table allowing for a pattern match. Pasting a sheet of wallpaper and keeping the face clean is very important. This is made easy by keeping the wallpaper in line with the edge of the paste table, pasting down the centre of the paper gently working your way to the edge. Spreading the paste should always be on an outward stroke. If you’re a bit of a novice, check the pattern match; this could be a straight match, where the pattern is straight across the wall or a reverse hang (where every other length is hung upside down). Alternatively, you can hang it in a drop pattern where every other length the pattern is seen to drop. This and other information can be found on the hanging instructions so make sure you read them. Top tip – Position the pattern at the top of the paper so that it’s pleasing to the eye. Centre any patterns on the main feature of the wall. That could be a chimney breast, feature wall, or just in the centre if there’s nothing of note. Check if the ceiling line or coving is straight. You can do this by drawing a straight line around the room with a spirit level and pencil then measure from that line to the ceiling/coving. Hanging wallpaper around sockets and switches is easy once you know how. Always turn off the electric when hanging wallpaper around a socket or switch, cutting across to each corner and trimming the excess off. If you’re worried about doing this, get an electrician to remove them first. To trim at the ceiling and skirting lines, gently crease the wallpaper into the crevice, then, with a thin-bladed spatula, push it into the crevice. The spatula protects the wallpaper as the blade cuts it. Make sure the blade is fresh and sharp. Never wrap wallpaper paper in and out of an internal corner, always trim about 3mm to 5 mm onto the unpapered wall. Use overlap paste and plumb a straight new length out of the corner after matching it. When overlapping any wallpaper in corners, around windows or hanging boarders, use a strong boarder and overlap adhesive. In many properties, both internal and external corners can be uneven. It’s so important that you always hang wallpaper straight. Cut a line right on the corner where the paper meets the skirting corner. This will allow for the paper to be smoothed round the external corner. Check it’s level. If it is, great, carry on. If it’s not you will have to trim the returning paper about 15mm to 20mm then match a new length. Depending on the type of wallpaper and pattern match, it can be overlapped using overlap and boarder adhesive. Keeping it a few mm back from the edge, but a much better finish can be achieved if it’s spliced. This process uses a straight edge, and very sharp snap blade knife; you cut gently through both papers and peel the underside off. Roll with your seam roller and wipe with a damp cloth. Good luck with your wallpapering project and let me know how you get on.